Sitting majestically on the famous Esplanade at Woolacombe and overlooking one of the UKs most popular and beautiful beaches is the prestigious newly refurbished Parade House once owned by lady Rosalie Chichester and the adjacent sympathetic newbuild additions. In 1890 there were no properties along the enviable Esplanade in Woolacombe when Lady Chichester of Arlington Court had first pick of where to site her holiday home, Parade House. She chose well, and the 3/4-acre development is in arguably the number one location in Woolacombe and North Devon. The development comprises 4 unique and private properties which all have stunning sea views through spacious windows creating an idyllic location for a memorable stay. Woolacombe beach has been voted No.1 beach in the UK several times and it’s not difficult to see why. Almost three miles of golden sand stretch out in front of this supreme holiday property and the west facing beach boasts some of the finest surf in the country, attracting surfers and families alike who enjoy playing in Woolacombes renowned safe and stimulating waves. The prominent and well recognised landmark building now comprises four unique luxury holiday homes, all with Four Winds hot tubs, private outdoor areas, contemporary Stephen Graver kitchens, state of the art Sonos systems, Wi-Fi, Bosche and Siemens appliances, parking spaces, Tesla charging point and of course those unforgettable views! Holiday Home Hunter is proud to act as agents for this amazing property so don’t miss out on this opportunity to holiday in one of the newest and most sought-after accommodation and location in Woolacombe. Of the four properties at Parade House the Beach Hut is somewhat undersold by its name. 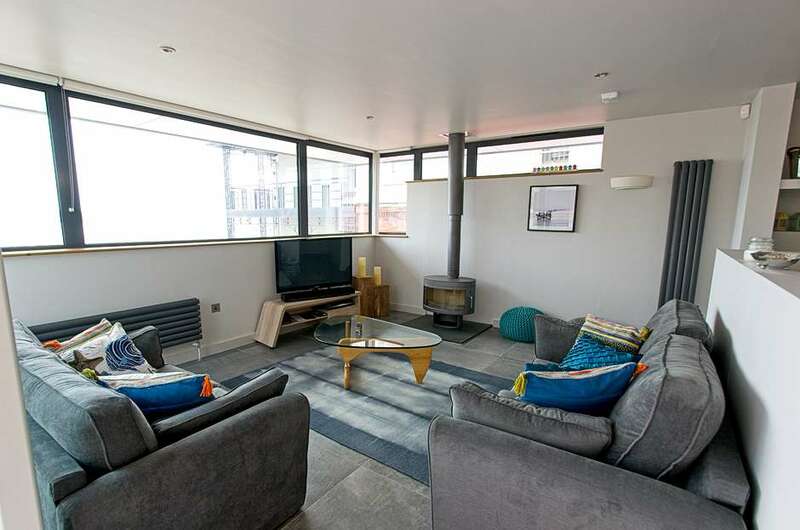 This fantastic twin bedroom detached property comes complete with a very spacious living area, two well sized bedrooms, private courtyard with Hot Tub and even its own balcony area – all with superb views. Perfectly proportioned, the stunning property is designed to look great from the outside but most importantly, looks after those on the inside. The kitchen living area benefits from a Stephen Graver designed kitchen and windows / bifold doors all along the southerly aspect. With stylish tiled floors throughout the living area, The Beach Hut benefits from brand new Bosch and Siemens appliances to include a full-size dishwasher and washer dryer and great looking Silestone worktops leaving you wanting for nothing from your stay. The vibe is laid-back, but the finish is luxury. Home from home luxury to satisfy even the most discerning while all done in a tasteful and modern style to compliment the family. The open plan living area connected to the kitchen has its own bay window style views looking straight out to sea. Sofa bed in living room for an additional one to two people if required. Equipped with the latest Sonos sound system and Panasonic 55” TV, the temptation will be to hang out inside but fortunately with doors straight out onto the decking you can have the best of both worlds. For the cooler evenings, the living area of The Beach Hut has its own log burner to set the right mood for cosy nights in. There are 2 luxury bedrooms in The Beach Hut both well sized. Bedroom 1 comes with a Super King size bed and luxury en-suite. Bedroom 2 is twin bedded with zip n link beds meaning they can be singles or a super-king so please advise your preference when making the booking on the on-line booking form. The Beach Hut comes with its own private courtyard and balcony. Enjoy the sun setting over the sea horizon from the balcony or sip champagne from your own private hot tub in the private walled courtyard (no view from the tub). There is off road parking for up to two cars (un-allocated) A £500 security deposit will be pre-authorised and then released again after the holiday. Please note, Parade House is ideally positioned on the sea front in Woolacombe. Whilst barely overlooked, the properties are still within earshot of other properties and we ask for noise to be kept to a minimum and that you have respect and regard for other Parade House guests and local neighbours. Whilst it has not been necessary in the past, we reserve the right to retain some or all of your deposit if there are complaints for noise pollution*. *verified under standard governmental environmental health guidelinesfor noise disturbances with environmental app. Travel cot, stairgates, a highchair and children’s cutlery, cups and plates are provided.